Boats are arriving, teams gathering, serious sailing and race tactics discussed and evening plans for serious fun prepared as the countdown to the start of the 39th St. Maarten Heineken Regatta continues with the Grand Opening of the Regatta Village. 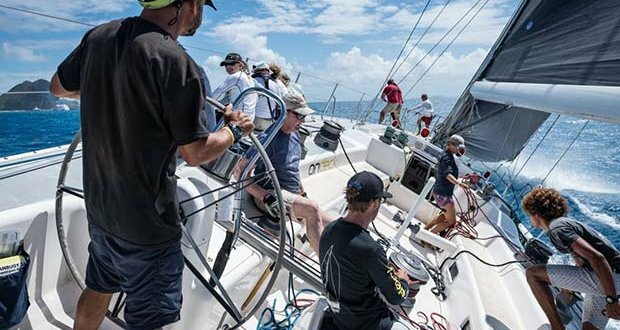 A key event on the Caribbean race schedule, the regatta attracts some of the world’s elite sailors and crews, with fast and furious racing in monohulls, maxis and multihulls with six races held over four days. For those looking for a more relaxed experience, the “Island Time Class” designed for cruisers, offers one race a day, ensuring all the fun of the regatta, without the stress! Part of the attraction of this regatta is in its variety, both in size of boat, origin and aspirations. Some of the world’s most elite performance race boats, such as Polish-entered Varsovie, a Swan 100S will be racing head to head against Umiko. This stunning Nautor Swan Frers 80 is skippered by yacht broker Bill Titus with a crew that collectively have raced in 150 St. Maarten Heineken Regattas, but this is the first time on Umiko. Bill comments, “I first raced in St. Maarten in 1993. Some of the tightest and most competitive racing, says Race Director Paul Miller, will be in the CSA 3 (Performance 40) group with 11 entries; meanwhile the five boats from Poland, including Sailing Poland, the Volvo Ocean 65 formerly known as MAPFRE, will be head to head against I love Poland, a Volvo Open 70. Both these boats demonstrate Poland’s commitment to developing young and promising sailors from Olympic classes into a regular professional Sailing Poland Race Team. “To acquire this boat [Sailing Poland] was a step forward in our mission to become one of the largest sailing organisations in Poland,” said Piotr Zygo, Sailing Poland’s CEO. On shore, the legendary parties at the St. Maarten Heineken Regatta continue to excel this year with festivities continuing long into the night. The Grand Opening saw live music from Remo and the Barbwire Band, with acts during the week including “Queen of Soca” Alison Hinds, Shermanology, Fatman Scoop with the highlight at the final night being The Jacksons, live on stage. Find out more about the St. Maarten Heineken Regatta, St. Maarten and island life here: www.heinekenregatta.com. Tickets for the regatta parties can be purchased from the St. Maarten Yacht Club.